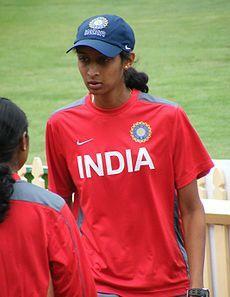 Snehal Pradhan is a cricketer of the India women national cricket team. She has played few women's One Day Internationals and T-20 matches for the India women cricket team. Originally a Pune girl, she has gone through much struggle to reach the Indian national team, in a country where women are still subjugated by the patriarchy. Presently she is an employee of the Western Railway, apart from being a cricketer. Recently she has been suspected for illegal action; now the question is whether this will affect the Snehal Pradhan cricket career or not. While the experts of ICC will be busy finding out whether she was right and wrong by checking out Snehal Pradhan bowling action video from different angles as many times as possible and try to come to a conclusion, let us a look into the biography and profile of Snehal Pradhan. College of Snehal Pradhan - She is a B.Sc in Microbiology from Abasaheb Garware College. Last ODI played - 30 June 2011 for India women versus England women in Derby. ODI - 6 matches, 3 innings, 2 not outs, 13 runs, highest score 6*, average 13.00, strike rate 40.62, catch 1. T20 - 4 matches, 3 innings, 2 not outs, 2 runs, highest score 2*, average 2.00, strike rate 25.00, catch 1. ODI - 6 matches, 5 innings, 216 balls delivered, 137 runs conceded, 5 wickets taken, best bowling figure 3 for 21, average 27.40, economy rate 3.80, strike rate 43.20. T20 - 4 matches, 4 innings, 67 balls delivered, 64 runs conceded, 6 wickets taken, best bowling figure 3 for 30, average 10.66, economy rate 5.73, strike rate 11.10. Latest News: Snehal Pradhan suspected for illegal bowling action and reported to ICC. Read more about Snehal Pradhan illegal bowling action. Image borrowed from Wikipedia commons under the Creative Commons Attribution-Share Alike 2.0 Generic license.